Who’s Having The Last Laugh Now? Do you like watching America’s Funniest Home Videos? I do. It never gets old watching people’s antics, especially when they go wrong. Most of the situations are harmless, although I’m sure some have led to an ambulance ride or two. It’s one thing to laugh at someone else’s expense for giving their six year old a bat for a piñata and then standing too close when the boy starts swinging. It’s another thing to laugh at someone’s misfortune or pain. He had it coming to him. Jennifer’s having the last laugh. I don’t know whether Jennifer is having the last laugh. But when I feel wronged, my initial response is to lash out, to get the final word, to see the person get what’s coming to them. I want to have the last laugh. When we rejoice in the misfortune of others–however small or great, we hurt still. We have not recovered. Our wounds are infected and need healing. We know we’ve recovered when seeing the misfortune of those who’ve hurt us saddens us too. Compassion, not criticism, reveals healing. Compassion doesn’t come quickly. It delays. It meanders its way to us. Compassion remembers what pain feels like. What to do? Ignore the hurt? Pretend it didn’t happen? Shrug it off? No. Feel the pain. Voice it out to God. Expose your feelings of betrayal before Him. Trust Him with your raw hurt. Then…and you’ll know when, pray for them, that God will draw them closer to Him, that He would meet their needs, that He would heal their wounds. That He would bless them. For example, Job prayed for “friends” who criticized, insulted, and blamed him for all the tragedy in his life. The Bible says “the Lord released Job from captivity when he prayed for his friends” (Job 42:10a). Our hurts hold us captive when we want to have the last laugh on those who’ve hurt us or our loved ones. God can release us from that captivity just like He did for Job. Job lived peacefully. He enjoyed life. He laughed–a lot. Can you hear his laughter? It isn’t a “you’ll get yours” type of laugh. It’s a laughter of healing, freedom, and compassion. Job chose his last laugh. You can too. Come alongside… Has someone hurt you or a loved one? 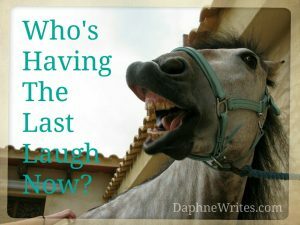 Are you waiting to have the last laugh? How can you start healing from this hurt? How can you pray for the person who hurt you or those you love? 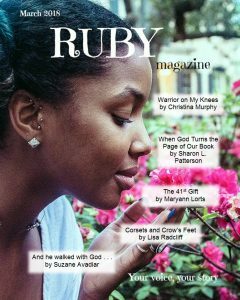 Do you have a story of a time you prayed for someone who hurt you? Comment below in the box that says, “Leave a reply.” Remember you can comment anonymously. Ever have to stand up for what you believe, knowing it might cost you something? 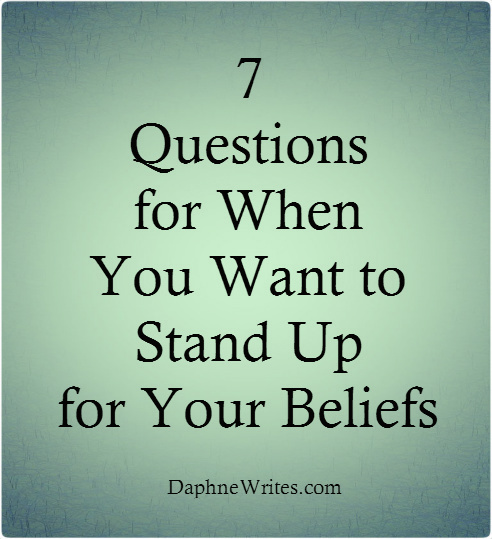 Standing up for your convictions can be difficult, especially when you’re codependent. Recently, I wrestled with this very issue. And when I say I wrestled with it, I mean I thought of it during the day and dreamed about it at night. I had no clue I was walking into a situation that was against my beliefs, but when confronted with it, I wanted out. The codependent side of me, however, crawled up my arm, propped itself onto my shoulder, inched up to my ear, and whispered its oh-too-familiar lies. They won’t talk to you again, they won’t want anything to do with you, they’ll talk behind your back. They’ll say you’re weak. You think you’re all that—holier than everyone else. You’re nothing. You’re a disappointment—even to yourself. The enemy sure knows my insecurities! He can prick any of these issues and usually get a reaction out of me. I knew right from wrong, and I wasn’t afraid to say so—tactfully, of course. I didn’t point fingers. I didn’t judge. I simply said I couldn’t participate, and I said why. Did my voice waver? Sure it did. Was I nervous? You bet! 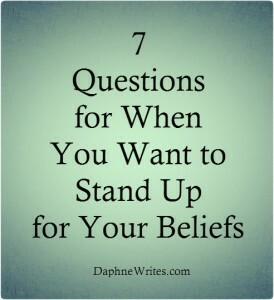 But I did it: I stood up for my beliefs. Their response? Cricket. Cricket. But… it didn’t matter—not then, not now. For me, it was either please God or please others, not both. As I think about what happened, I now see seven questions that could help me make the right choice next time. I hope these seven questions help you too. 1. How am I feeling? When something triggers our convictions, our conscience sends up red flags. Our palms sweat, our heart races, and we feel tingling in our armpits (or is that just me?). If we’re showing physical signs of excitement, we’re already not thinking clearly because our emotions are taking over. That’s when we’re more likely to react and make a rash decision (Mark 6:22). Being aware of our emotions when confronted with a compromising situation helps us to step back before making a wrong decision. 2. How does this issue or situation line up with what I believe? Although few things in life are black and white, there are absolutes. God’s word is absolute. When we use the Bible to define right and wrong, we’ll know when we face something that goes against our beliefs. Even if the Bible doesn’t address an issue specifically, we can still apply Biblical principles to our decision-making to help us align with God’s definitions of right and wrong. Knowing our boundaries and committing to them ahead of time is essential. Decisions made on the spot tend to miss God’s mark (Matthew 26:69-75). 3. Am I feeling pressured to compromise? When we’re surrounded by people who disagree with our beliefs—whether in words or actions, it’s tempting to go along with them. Peer pressure does exist, but it’s usually not as obvious as in childhood. (Thank goodness!) Indirect peer pressure is more common among adults. It’s also more subtle. If we’re not careful, our silence can signal acceptance. Remember, appeasing others displeases God (Mark 15:1-15). 4. Am I pressuring myself? Oftentimes, others don’t pressure us; we pressure ourselves. Although we know right from wrong, we reason that if we follow others, we’ll finally belong. But if we stand up, we risk standing alone. Isolation is scary because God made us for relationship—with Him. When we believe that the Lord our God made us to belong to Him, not to anyone else, we know that even if we stand alone, we are never alone. We have Him. He has us. The pressure we place on ourselves to belong to others ignores the fact that we are already His (Psalm 73:23-26). 5. Who can my decision impact? When we compromise our beliefs, we’re not the only ones to feel the results. Our families, friends, even fellow believers can suffer because of our hasty decisions (Exodus 34:5-7). 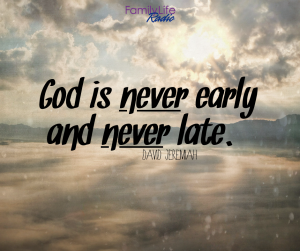 Our life will look different after our fateful choice—for better or worse. Our words and actions will either build up others or tear them down. They’ll either spread the hope of God or hinder His work. Our words can give life or death (Proverbs 18:21). Our split-second decisions can confuse or even tempt others to do the same (Romans 14:21; 15:1-2; 1 Corinthians 8:13). 6. Who will I please? Before receiving Jesus into our lives, we made decisions based on our own judgment or that of others. When we became Christians, we gave Jesus our allegiance (2 Timothy 2:4). When we do what He says is right, instead of what feels right, we please Him (Romans 8:8). We yield ourselves to His desires, His interests, His definitions of right and wrong. Basically, we do what He wants us to do. Even Christ did not please himself; instead, He did whatever pleased the Father (John 8:28-29; Romans 15:3). We follow His example. 7. How can I show God’s love? Choosing to do what’s right, instead of what’s popular, doesn’t mean we have to be obnoxious, judgmental, or rude. We can make our decision and, if necessary, state our reason, all the while showing the gentleness of our example, Jesus Christ. When we make the right choice but express it in the wrong way, we accomplish the opposite of what God wants—for all to see Jesus through us and be drawn to Him now and for all eternity (Proverbs 12:18; 13:3; Colossians 4:6). I slept soundly that night. Having a clear conscience has a way of doing that. The truth always sets us free (John 8:32).